Hello! 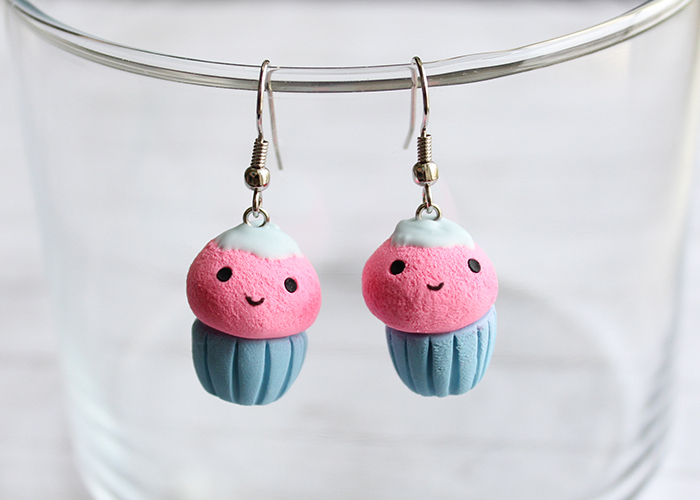 Today I’m sharing this Polymer Clay Cupcake Earrings Tutorial! Aren’t they the cutest little things? Let me show you how to make them! 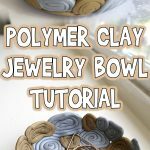 New to polymer clay? 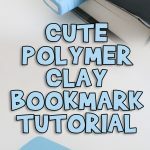 Check out my Introduction to Polymer Clay post for some basics and helpful hints! 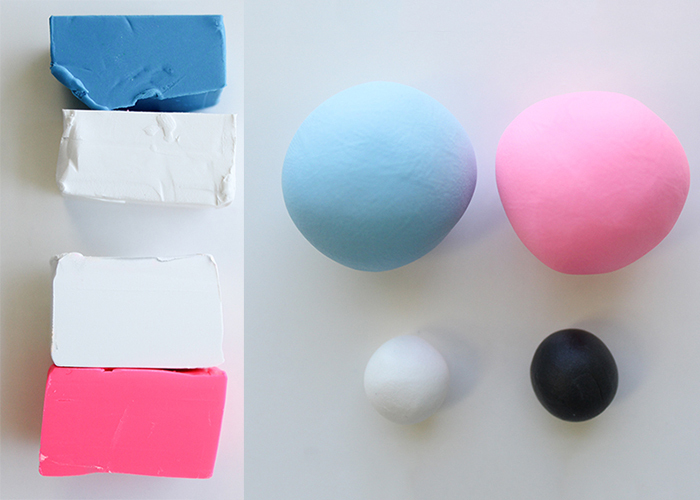 Pink, blue, white, and black polymer clay. Pink chalk pastels. Optional: for cheeks. Very hard bristly paintbrush or old toothbrush. 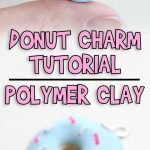 Start by taking your pink and blue clay and mixing them with an equal amount of white clay to create a light blue and a light pink clay. 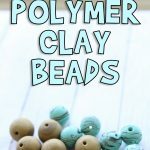 Set those aside and make sure to also have small balls of white and black clay. I mixed a bunch of extra clay, so there’s enough here to make several pairs of earrings. 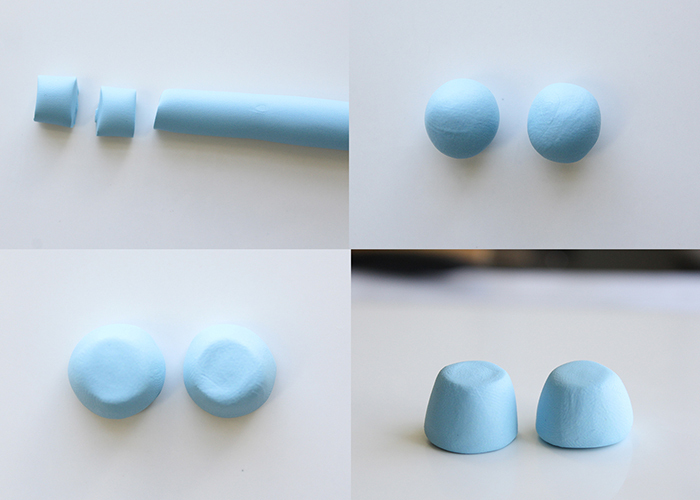 Remember, you only need a little bit of clay for miniature items. 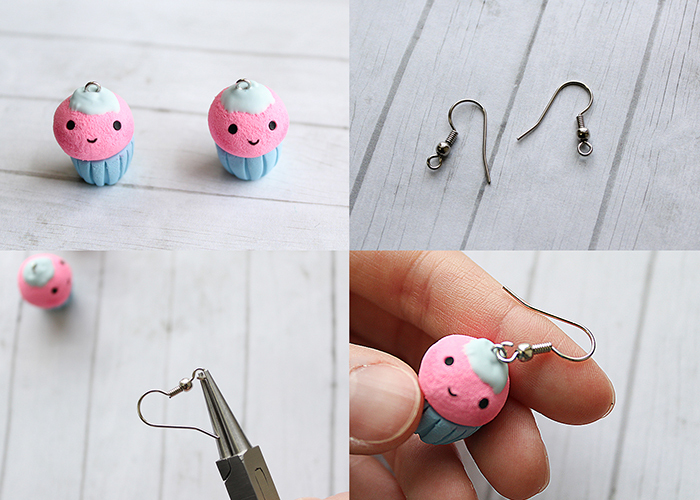 We’re going to make both cupcakes together, so they end up being the same size for earrings. Let’s start with the blue clay for our cupcake base. 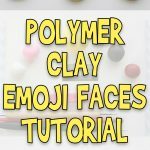 Roll out some blue clay and cut two equal sized pieces. Roll them into balls, and make sure they’re the same size. Shape them into these angled cylinder shapes. They should look like those little Rolo candies. Don’t worry if they’re not identical, we’re aiming for sisters, not twins. This is what they should look like from the top and the side. 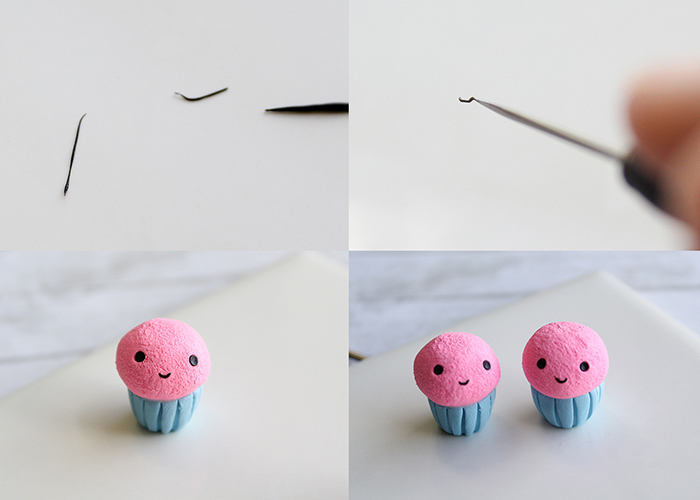 Now take your needle tool and make indents all along the outside of both of your cupcake wrappers! Flip them right side (the wide end) up, and set them to the side. 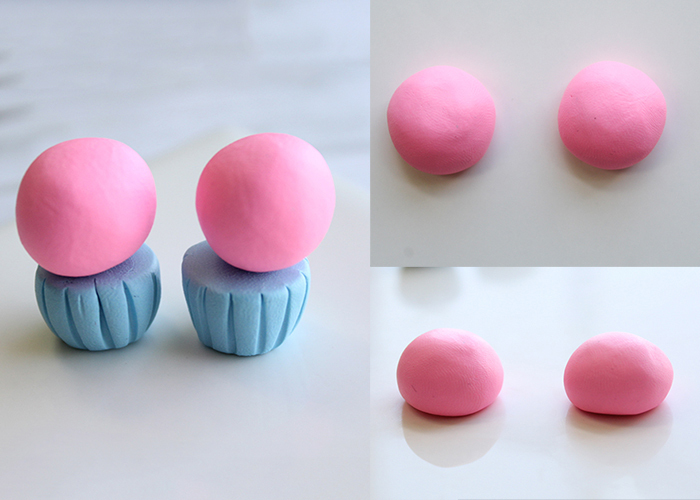 Now roll up two balls of pink clay, slightly larger than your cupcake bases. 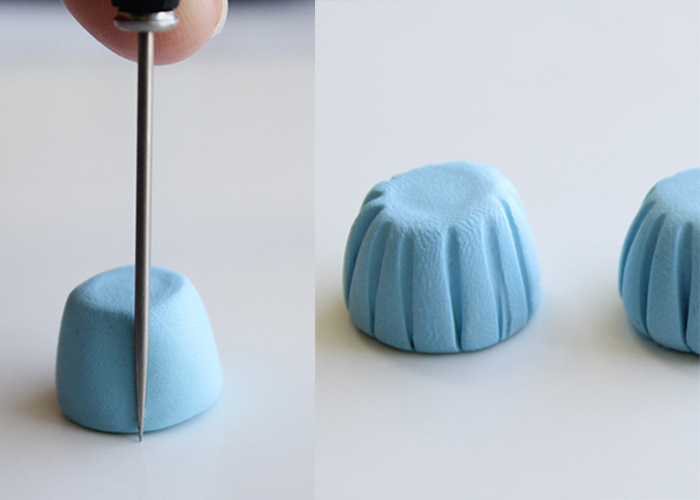 Set them on your work surface, and shape them with your fingertips into rounded dome shapes. 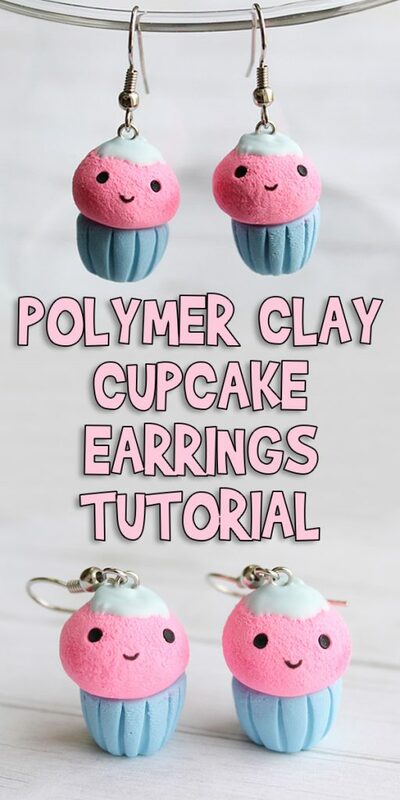 Now take some translucent liquid clay and put a tiny dot on the top of your cupcake wrapper, and put your pink cupcake on top! The liquid clay helps the bottom and top stick together when it bakes. It might slip around a bit while you’re working on it, but just make sure it’s centered before you put it in to bake. 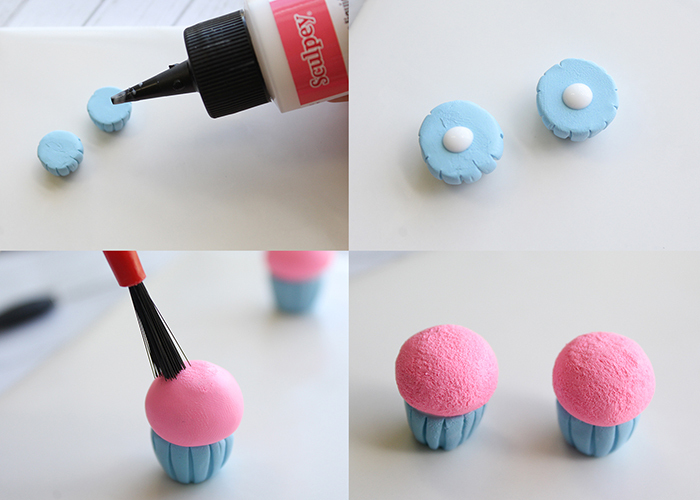 Now using your rough paintbrush or an old toothbrush, texture the top of your cupcake. Let’s make some cute faces! 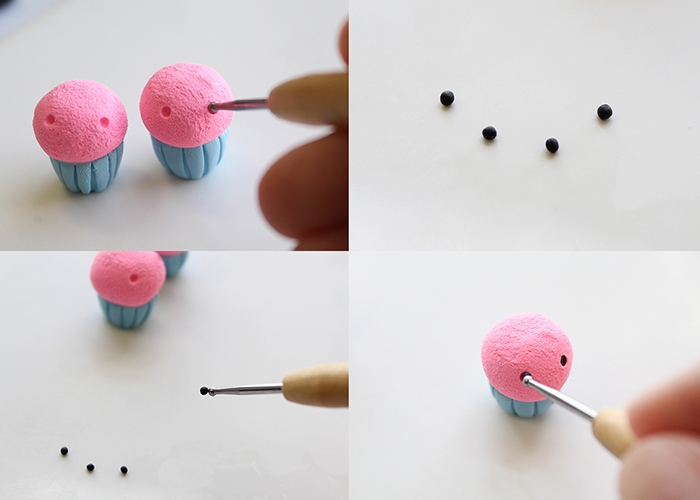 Take your dotting tool and make two holes where you want your cupcakes’ eyes to be. Then make 4 small balls of black clay about the size of the tip of your dotting tool. Pick up one piece at a time with your dotting tool, and gently press it into the holes we made for the eyes. It’s that easy! Now the mouth is a bit trickier. Roll a very thin snake of black clay, and trim a bit off with your needle tool. Then work it into a curved shape with your fingertip, and set it on your cupcake’s face. Gently pat it down so it stays put with your fingertip. Both cupcakes look similar, but they each have their own cute expression. This part is optional, but if you want to add cheeks, grab a dark pink chalk pastel. 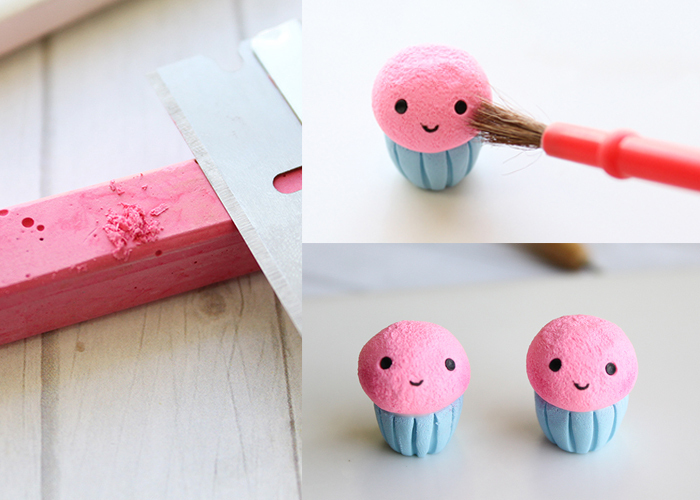 Scrape up a bit of pastel dust with your blade, and use your soft paintbrush to dust it where the cupcake’s cheeks might be. That’s how easy it is to add shade and color to clay. My favorite part of a cupcake is the frosting, so let’s make some! Chop up a bit of white clay, and mix in about twice that amount of translucent liquid clay. I also decided to add a bit of blue clay for a super light blue frosting. 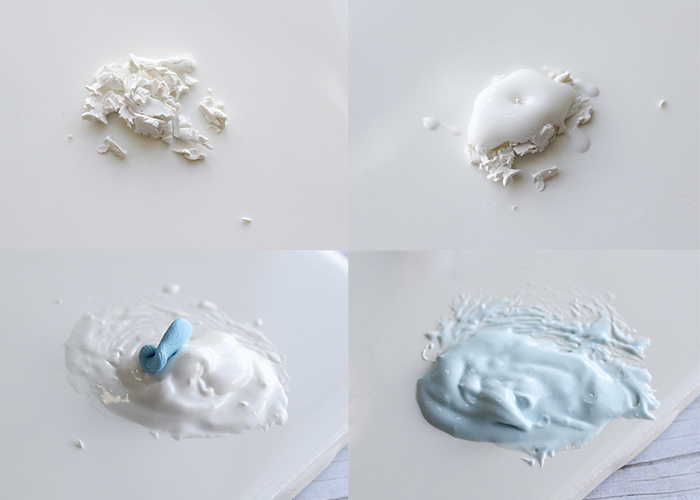 Keep mixing for a while, adding a bit more liquid clay if you need to, until it’s all smooth and it’s the consistency of a thin toothpaste. 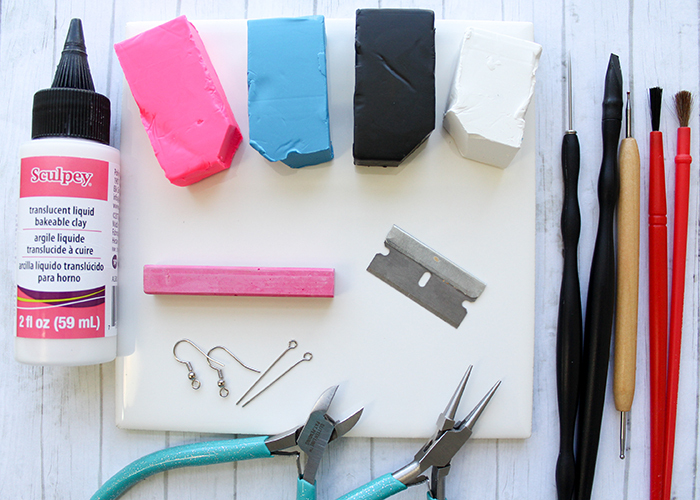 Take your small spatula tool (or you can use your needle tool) and spread on that frosting! 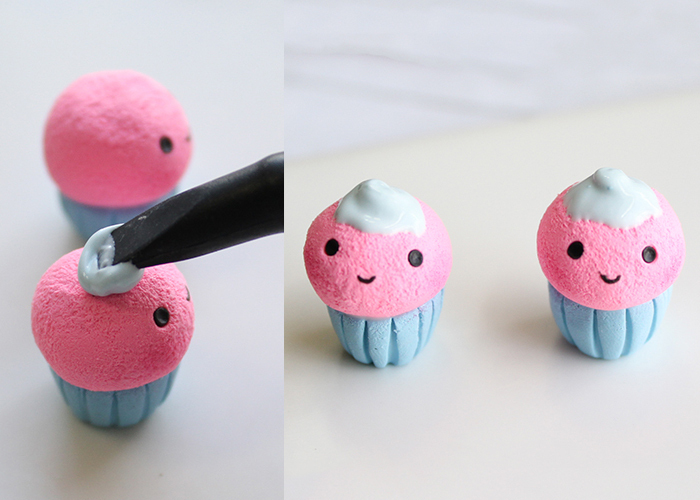 Now we need to put some eye hooks in these cute little cupcakes! Trim down your eye pins so they’re shorter, and use your pliers to put a small bend in the bottom. This bend keeps the eye hook from pulling out after the cupcake is baked. Insert the eye pin, curving it into place, and make sure the opening of the eye is the same direction as the cupcake face. Make sure everything is how you want it to look, and put your cupcakes onto a small piece of copy paper on top of your porcelain tile in a baking dish. Pop the whole thing in the oven and bake according to the instructions on your clay packaging. I used Sculpey brand clay, and baked mine at 275 F for 30 minutes, and they turned out perfect! Let your cupcakes cool down completely. Then take your earring hooks, and open them up by twisting the bottom ring outwards a little with the pliers. Then slide your earring hook onto the eye pin, making sure that the rounded part of the hook is on the same side as the face. This makes sure the face shows in the right direction when you wear them. Gently close the ring on the earring hook, and you’re all done! 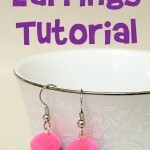 I really hope you enjoyed this Polymer Clay Cupcake Earrings Tutorial!! 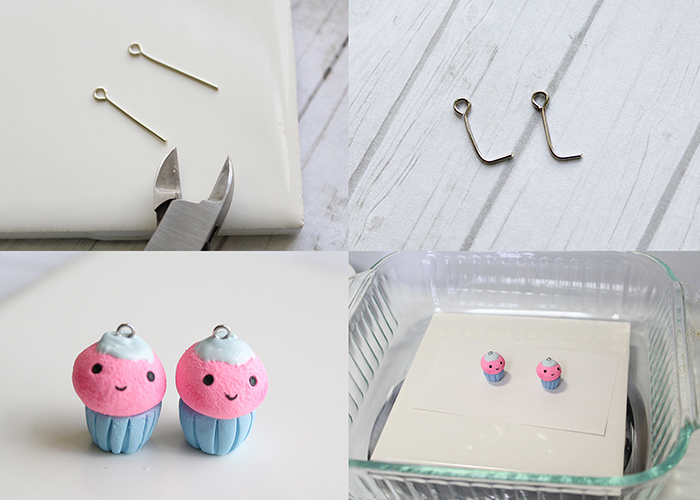 Have fun wearing your cute little creations, or give them as a gift!